After a hectic but enjoyable summer we headed off on a little summer holiday to Spain to relax. Whilst there we enjoyed many a cocktail on the beach, but would always come back to the classic Mojito. Once back home, with the weather starting to draw in (there’s new sightings of snow on the horizon! ), and plenty of mint in the balcony garden, we tried to recreate those summer days on the beach, with the sea lapping at our feet. And what’s better than a Mojito? A Mojito in dessert form! 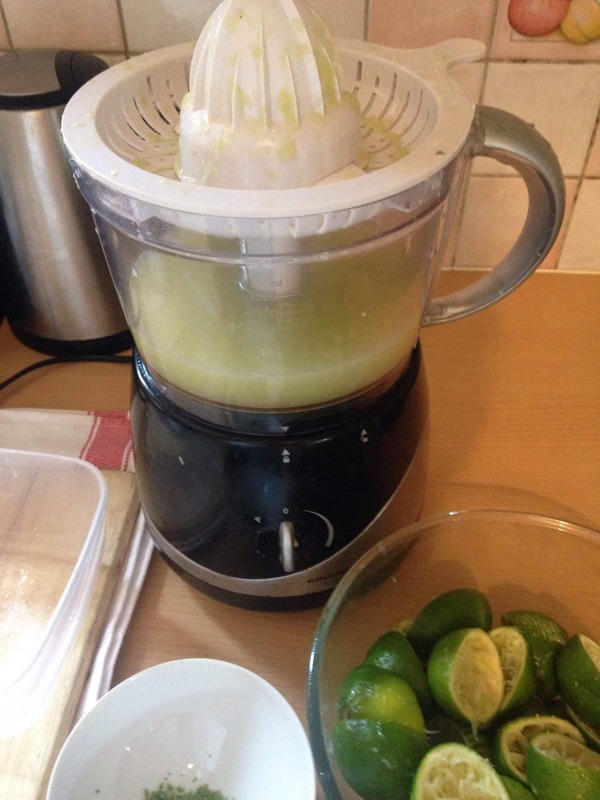 1, Place the sugar and water in a saucepan with the lime zest over a gentle heat. Stir until the sugar has completely dissolved, let the syrup come up to the boil and then turn off the heat and leave to cool for about 15 minutes. 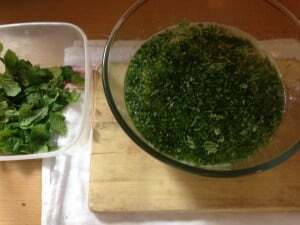 2, Whilst this is cooling wash the mint in a bowl of cold water, pat dry, and pick the fresh baby leaves. Try not to use the older larger ones as they may be a bit bitter. 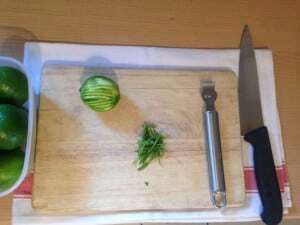 You will need one cup of picked leaves finely chopped. Then add to the syrup. 3, Add the lime juice & rum to the syrup and stir. Put this in the fridge until chilled, around 30-40 minutes. Note that adding rum will produce a softer sorbet, as alcohol will not freeze, so be careful not to add too much, or it may not set enough. 4, Once cold, pour the contents into an ice cream maker, and follow your models instructions. This usually takes around 25-30 minutes to become set. 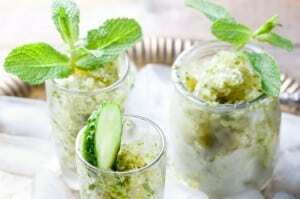 5, If you don’t have an ice cream machine, just pour the lime syrup into a Tupperware box and stick in the freezer, stirring vigorously every half hour, or so, to prevent ice crystals forming. After 4 hours or so, it will be ready. 6, Take the sorbet out of the freezer about 5 minutes before serving, scoop into glasses and pour over more rum if needed! 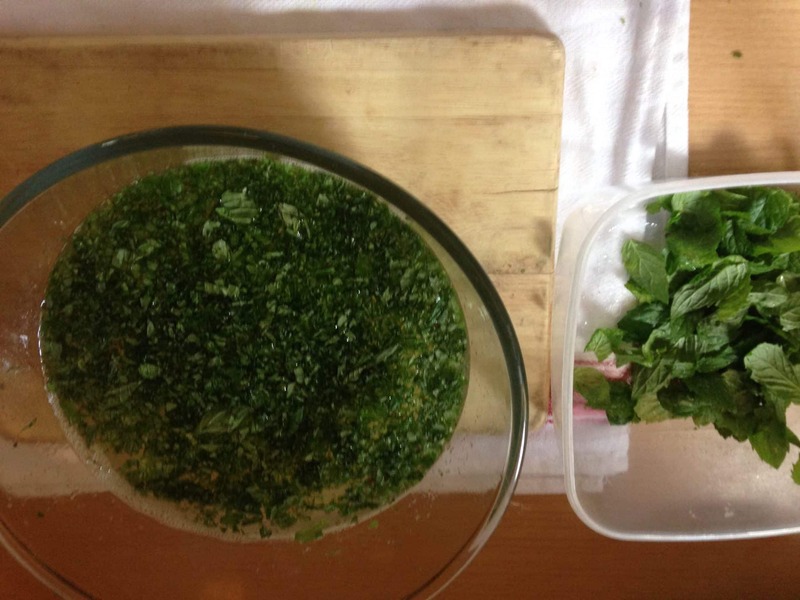 Add a sprinkling of brown sugar to the top to give it the real Mojito crunch. And Voila guaranteed to wow any dinner guest. This goes perfectly with anything chocolatey! Our favourite would have to be Gooey Chocolate Fondant with Mojito Sorbet, yum yum! 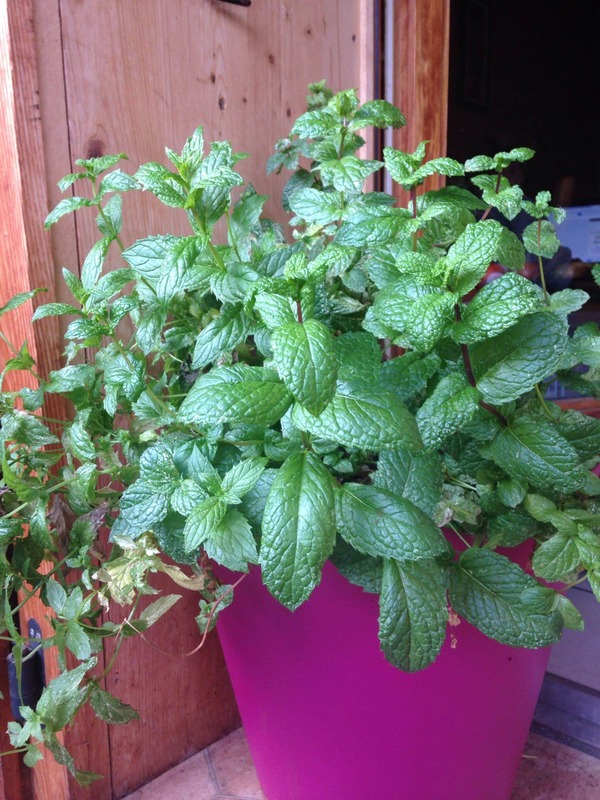 Be on the look out for Mojito sorbet in our upcoming winter menu!